I love books, but the medium isn't as important as the story itself, and I often find a well-developed television series as engaging as a great series of books. Here are some favorites that are currently available at bargain prices. These books will sell out quickly, but for the time being most are actually cheaper than the freshly released mass market paperback versions of the same book. This is a great opportunity to get hardcover books into your home library and on your shelves. I’m a sucker for hardback books. Unless listed otherwise, these are all bargain price hardcover copies from Amazon.com . Jayne Castle has released several cute book trailers (video ads) for her books in the Ghost Hunters series. I like them because they feature the dust bunnies, which just happen to look exactly as I pictured them! My favorite is the Dark Light trailer because of how it incorporates the teaser for the story itself. The dust bunnies are cute, but it’s the book’s story that appeals to me most. 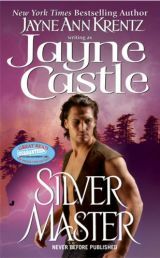 This book trailer is for Jayne Castle’s Silver Master. It features Araminta the dustbunny. 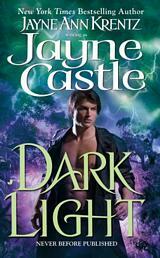 This book trailer is for Jayne Castle’s Dark Light, and features Elvis the dust bunny. I’ve read more of Stephanie James’s books than I can actually remember, and I blame that on the fact that I was heavily into Silhouette Desire romance novels back when I was a teenager. At that time in my life, I rarely paid attention to who I was reading, since all my books were by way of the local library and a few book-loving relatives. I read what I had on hand. That said, there are several titles that stand out and that I actually remember from the list below. Here’s a page outlining Stephanie James’ (Jayne Ann Krentz’s) pseudonyms. Night Of The Magician stood out for me, possibly because it had elements of magic and paranormal that weren’t usual to the Silhouette Desire line at the time. Elizabeth Boyle, author of English historical romance novels, is a more recent addition to my favorites. It’s always nice to find an author who writes great books and also has a backlist large enough to keep me happy for a while. That’s been the case with her. I read One Night of Passion a few weeks ago and decided I had to read more, especially once I found out many of her books are connected by family and repeat characters. If you’ve spent any time on this site at all, you’ve already figured out that I love series. So far, Elizabeth Boyle writes only historical, and frankly I hope that’s where she stays. Her writing is fresh and fun and I so enjoy her characters! Of course, there’s the first book by Elizabeth Boyle that I read, One Night of Passion . How can it not be a favorite since it introduced me to both the author and the Danvers family? I loved Georgie and Colin, and everyone else who played a part in the story. Another favorite is Something About Emmaline , with a hero who has invented a fake wife for himself to keep marriage-minded females away. I love the way he’s introduced to his suddenly real fake-wife-Emmaline. Emmaline was a lovely character and Sedgwick was totally entertaining. There are also quite a few of Elizabeth Boyle’s books available for the Kindle . 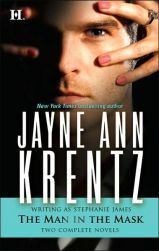 Here’s a page outlining Jayne Taylor’s (Jayne Ann Krentz’s) pseudonyms. Here’s a page outlining Jayne Bentley’s (Jayne Ann Krentz’s) pseudonyms. I enjoy series because they often have exponentially greater depth than a single stand-alone novel. I like revisiting beloved characters and universes and getting to read as the universe is expanded.